Sponges used in surgery can be responsible for serious complication or even death when they are not easily detected and removed. Their presence is often masked by nearby bone. However, X-ray detectable sponges are affordable, easily detected and suitable for operating room and surgical applications. Within the gauze is a heat-bonded barium sulfate marker to allow vivid and accurate x-ray visibility. With a barium sulfate content of more than fifty-five percent, these particular sponges exceed the minimum requirements. 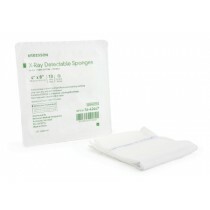 Many surgical applications require an x-ray detectable sponge. The unique composition of this type of sponge allows them to be easily located within the body in the body, similar to the X-Ray Detectable Lap Sponges. It is constructed from USP Type VII gauze, which incorporates a dual-colored element. By combining a white and blue radiopaque strand it becomes visible when saturated with blood. They are latex free and manufactured with a particular double vacuum process that eliminates lint, which minimize the presence of lint. They are made from highly-absorbent cotton and have a heat-bonded sulfate marker, which makes it extremely visible. They are suitable for sterilized operating rooms and for all surgical applications.